Om Mani Padme Om, Om Mani Padme Om, Om Mani Padme Om. This is Boudanath's deep noted and constant mantra that drones in human stereo as you venture into Nepal's heart of local Bhuddism. As the biggest stupa in Nepal, Boudanath dominates the Kathmandu skyline pulling a large population under its wings including Tibetan refugees who fled from China in the '50s and huddled close to their place of worship. What an explosion of colour they bring as dressed in their traditional Tibetan costumes, they vend their goods or do circumambulations around the stupa. 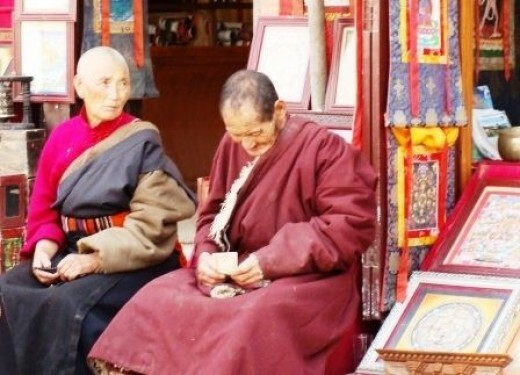 ​Since that time the Tibetans fled to this area, Boudanath has seen the construction of over 50 Tibetan Gompas (Monasteries) and has become a little Tibet of shops and restaurants filled with crafts to delight the eye and lighten the pocketbook. To protect the sacredness of this holy place and some of its serenity, the management committee of the Stupa passed an ordinance forbidding the vendors form plying their trade on the path where the worshippers walk in an endless circle around the main building, spinning prayer wheels as they move. In our visits, the place there has a sense of hustle and bustle, but no intrusiveness of the classic temple with beggars and sun glass wallahs. And there is a peacefulness that comes from the rhythm of the endless "Om Mani Padme Om" drone as an undertone to all activity. Originally, a stupa was a simple mound of mud or clay to cover relics of the Buddha. But today, these monuments have become big centers of prayer for the committed. Of the really old stupas still intact today, most are believed to contain relics of the Buddha and the belief can make it true to the believer. When a great Buddhist teacher passes away, the belief is that his mind dwells in that spot forever in an unchanging way and Buddhists erect a stupa in his honor. These stupas eventually became lively centers of worship. In 1979, Boudanath was declared a World Heritage Site by UNESCO. But this stupa was already popular to ancient Tibetan merchants who rested and worshipped here. Said to contain the remains of Kasyapa, an old sage venerable not only to Buddhists but Hindus, it already attracted many visitors even then. Legend said that after Kasyapa Buddha's demise, a certain old woman, with her four sons, interred this great sage's remains at the spot over which the great mound now stands. She later petitioned the King of the time, and obtained permission to "proceed with" building a tower. As a result of her effort and that of her four sons, the groundwork of the structure was finished. Those who saw it were astonished at the greatness of the scale of the woman's work. Jealous of her success, the high officials of the country then said that if such a poor old woman was able to complete such, they themselves would have to dedicate a temple as high as a mountain. So they decided to ask the King to disallow the further progress of the work. When the King was approached, his Majesty clearly replied: "I have given this woman my order to proceed with the work. Kings must not eat their words. I cannot undo my orders now." So the tower was finished, and hence its unique name, "Ja Rung Kashol Chorten Chenpo." 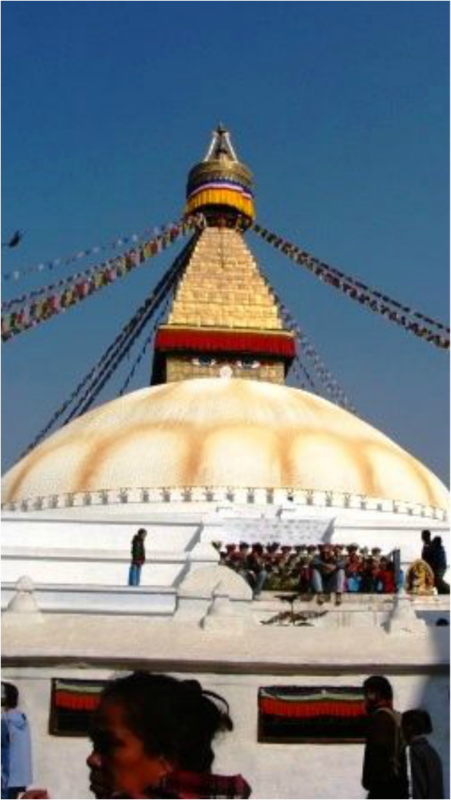 The Stupa is on the ancient trade route from Tibet which enters the Kathmandu Valley by the village of Sankhu in the northeast corner, passes by Boudnath Stupa to the ancient and smaller stupa of Ca Bahi (often called 'Little Boudnath'). It then turns directly south, heading over the Bagmati river to Patan. As this route bypassed the main city, Kathmandu became a later foundation. Today, this is a very sacred destination for Buddhists. Many Buddhists from all over the world come here for pilgrimage each year.